Camping gear gets dirty quick and it isn’t always easy to clean. This is especially true when you get back late from a weekend camping trip and have to get it all cleaned up before heading back to work on Monday. For this reason, it’s natural to ask, are camping tents machine washable? Camping tents are rarely ever machine washable and washing your camping tent in your washing machine will most likely destroy it. A camping tent is sewn together so that the seams can keep water out even in the rain. Wash your tent in a machine and you may end up ruining these seams. The exception to this is a tent that is made from only one section. For example, if your tent is more like a tarp and there aren’t any seams to worry about then you may be able to get away with washing it in the washing machine. 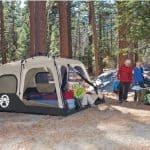 Of course, this type of tent may not even really be considered a true camping tent since it will not provide you with 360-degree protection from the elements. The same goes for drying. You never want to put a camping tent in your dryer. Laundry appliances can cause rips and tears in your tent and even if you don’t end up with a visible tear, the tent’s seams will most likely lose their ability to stop leaks. Now that you know that you can’t wash your tent in a washing machine, you’re probably wondering how to wash your tent. In the rest of this post, I’ll go over the best ways to clean a camping tent. For those of you with small tents, it may be easy to wash your tent in a bathtub. This is especially true if you live in an apartment and don’t have access to an outdoor area. I’ve washed my small 2-person Eureka tent in my bathtub in the past and it works perfectly. Open your tent and spread it out as best as you can in your tub. Pour enough warm water into the bathtub to cover the tent. Gently scrub your tent using a soft sponge to remove the bulk of the dirt. Pull off any large pieces of debris and put them into a trash can so that they do not clog your bathtub. Drain the dirty water and refill the bathtub with warm water and a small amount of laundry detergent. Let the tent soak for 15 – 30 minutes. Scrub any remaining dirt off with your sponge. Drain the soapy water and wash any remaining soap off of your tent. Be thorough about getting the soap off of the tent, rinsing it for as long as you have to. Dry the tent out by setting it up and letting it sit out. You can speed this process up by aiming a fan towards the tent. When I had to wash my tent in my apartment I usually dried it out by setting it up on my balcony in direct sunlight. Some apartment communities would certainly frown upon this but luckily I worked for the one I lived in so this wasn’t really a problem for me. When I wasn’t able to set my tent up on my balcony, (owner was in town), I would set it up to dry in my kitchen. I had forced air heat so the air would naturally dry the tent out quickly in the winter. For larger tents, you’ll need to have access to an outside area. An apartment dweller can actually use one of those DIY car wash places without much trouble but drying out the tent afterward can become an issue. My best advice in this instance is to borrow a friend or family member’s backyard for the day. Start in the morning and choose a sunny and breezy day so that the tent will have a chance to dry out. Storing your tent before it has had a chance to dry out can lead to mold, mildew, and a smelly tent. Fail to properly dry your tent and you may end up making it dirtier than it was before you started. Here are the steps for washing a tent outside. Before you get started, you’ll need two large tarps, a hose, a bucket, a sponge and some laundry detergent. Spread your tent out on the ground and thoroughly rinse it. This should remove any large pieces of dirt or twigs that may be stuck to the tent. Place your tent on top of one of the clean tarps. This will keep the dirt and grass from your yard from adding any new dirt to your tent. Fill up a bucket with warm water and laundry detergent. Scrub the tent with your bucket of water and your sponge. Thoroughly rinse all of the soapy water off of your tent. Spread your now clean tent out onto the other tarp to dry for a little while. Once the tent has begun to dry, set it back up in the sun to allow it to dry faster and more thoroughly. At this point, it should already be dry enough that it will not cause mud underneath of it. After you’ve cleaned and dried your tent, you may want to inspect it. Even the most careful cleaner may end up tearing a seam or stripping the waterproofing from the tent. If you notice any tears or holes in your tent, patch them as soon as the tent dries. Seam tape and seam sealant can be applied to all of your tent’s seams regardless of whether or not they’ve been damaged. This will help prolong the life of your tent and will ensure that you do not get any leaks while out camping. You can further waterproof your tent by applying a spray-on water repellent to the sides and bottom of your tent. Don’t go too heavy when coating your tent and make sure the coating has a chance to dry before you pack your tent up for storage. It’s always best to wash your tent as infrequently as possible. Washing a tent reduces its durability and makes it more susceptible to the weather. Typically, I’ll wash my tent at the end of each season and will only wash it in-between if I’ve subjected it to a lot of dirt. Also, remember that you don’t always have to fully wash your tent to get it clean. For instance, after camping on the beach I’ll shake the tent out to remove any sand and will then hose it off to remove any salt water that may have ended up on the tent. In this case, scrubbing the tent and adding soap to the wash is not necessary. Using bleach on your tent will most likely ruin it. Bleach is a harsh chemical and should be avoided when washing your tent as it may weaken the waterproofing and can even lead to holes in the tent. While some people may recommend that you use bleach to remove mold and mildew from your tent, it is better to simply leave it out in the sun on a dry day. The UV exposure will dry out and kill the mold and mildew and you’ll then be able to remove it with a simple cleaning without having to resort to using bleach. Some sleeping bags are machine washable and some are not. Synthetic sleeping bags usually allow for machine washing and down sleeping bags do not. Always check with the manufacturer before washing any sleeping bag. In most cases, the sleeping bag will have a tag inside of it that will provide you with directions on washing it. I’ve found that many synthetic sleeping bags will allow you to wash the sleeping bag in warm water with a mild detergent. In some instances, you may be able to tumble-dry in the dryer afterward and in some cases, you’ll have to dry the sleeping bag out on a line.